Shopping at dollar stores always help you to save more. And there are a few options to look at. The first one is known as the Dollar Tree where you’ll get items at $1 or less. The second one is known as Family Dollar where you can buy products at less than $1 to $10. The third one is Dollar General where various items are available at less than $10. In short, you’ll definitely get a good deal. So, if you are planning a party or if you want to buy some household stuff, you have to visit these stores. 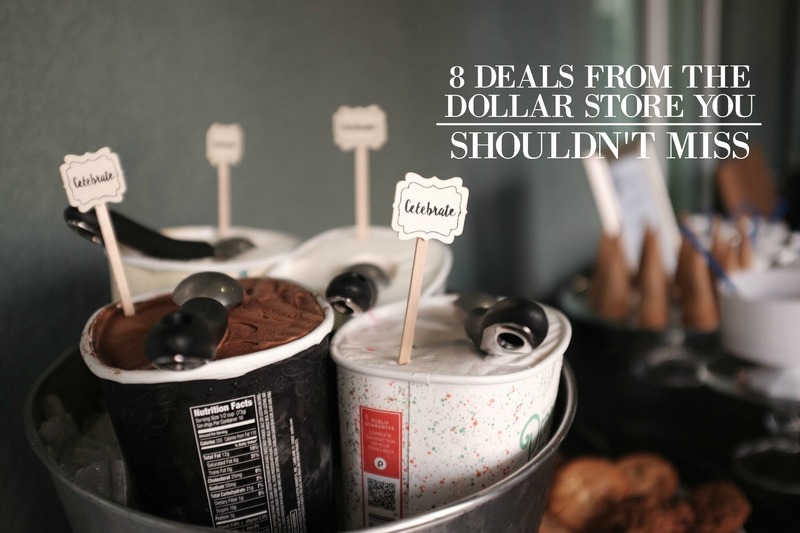 And today we are going to explore 8 things that you should always buy at the Dollar Store. Let’s take a look. First of all, getting old vinyl music records is a herculean task. Buying these records from other music stores will definitely cost you a fortune. But at the dollar stores, you get some great music records of classic singles at tremendous discounts. Most of these records are sold at less than 10 dollars. Even the best bargains at your favorite music shop would fail the price challenge from the dollar stores. Dollar stores possess an endless variety of greeting cards and holiday cards for every occasion. The stores charges you just $1 for a single greeting card. And these are not plain ordinary cards, but elegant and well-designed greeting cards for evergreen use. Compare it with other retail stores in and around your city, and you will see a savings of 2 to 3 dollars per card. We suggest you purchase in bulk and store these cards for upcoming festivals, birthdays, and anniversaries. Dollar stores are your go-to shopping hangout for a weekend party or a special get-together with friends. Tablecloths, cups, plates, cutlery and anything you can imagine. Party decorations have never been so affordable, as you’ll get all the items at a great price range. Choosing the right gift is an art, but wrapping it up with the best packages is equally crucial. Wandering around various shops for the best gift wrapping within a tiny budget is a no-brainer. Dollar stores charge you as little as 1$ and present a magnificent range of gift boxes, gift bags, gift papers, tissue papers and multicolored bows at the cost of peanuts. These are not the dull and mundane plain wraps, but attractive packages to hit the bull’s eye at the next celebration. If you are looking out for brand new kitchen supplies on a tight bargain, you ought to check in at the nearest dollars store. Starting from frying pans and mixing bowls to long-lasting crockery items, dollar stores have to be your one-stop destination. The wide variety of kitchen containers from the most trusted brands in the market are available in stock. Kitchen supplies at dollar stores give a charming feel and added efficiency to your kitchen. Welcoming your guests with cute little goodies bags are quickly becoming a custom. Dollar stores have hundreds of gift items for you which would stand out as unique presents without hurting your wallet. Birthday gifts for kids, souvenirs for visiting guests, tokens at an old school reunion or a family get-together, dollar stores keep a massive stock of various gifts for every occasion and each season. Small toys, delicious candies, card games, goodie bags with chocolates, health and beauty supplies are some of the inexpensive gift items in their repertoire. The harsh winter season demands a complete set of body warming apparel. Apart from jackets and overcoats, one must have a pair of woolen socks and knit hats handy. Customers face a problem considering the extensive range of color schemes and designer patterns available at the store. Dollar stores are a mini boutique for dirt cheap winter accessories starting as low as $1. Dollar stores can also be called an in-house mass storage of cleaning supplies. Bathroom and toilet cleaners and tile washing detergents can be bought with just a few dollars. In spite of being really cheap, these cleaning appliances are a bang for your buck. Dollar stores are the one-stop solution for all your household cleaning needs. Now if you have any favorite dollar store items yourself, let me know in the comments down below!